MusicMaster Integration with DMDS | by Aaron Taylor – WELCOME TO OUR INTERNATIONAL SUPPORT! This is another in a series of articles we’ve created to direct you on how you may integrate MusicMaster for Windows with major content providers available to the broadcast industry. This time, we detail how to use Digital Media Distribution System with MMWIN. 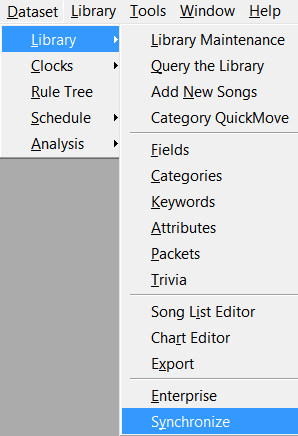 In addition to the broadcast quality audio files, DMDS allows you to download metadata about the tracks selected that can be synched into your MusicMaster for Windows database. We will not attempt to cover all of the powerful features and functionality available to the user in this application, but encourage you access the extensive documentation DMDS has provided to the user to get the most out of this valuable resource. If you have not yet established a username/password for DMDS, go to www.dmds.com and select “SIGN-UP”. Fill out the information requested on the forms, submit and wait for your membership to be approved. 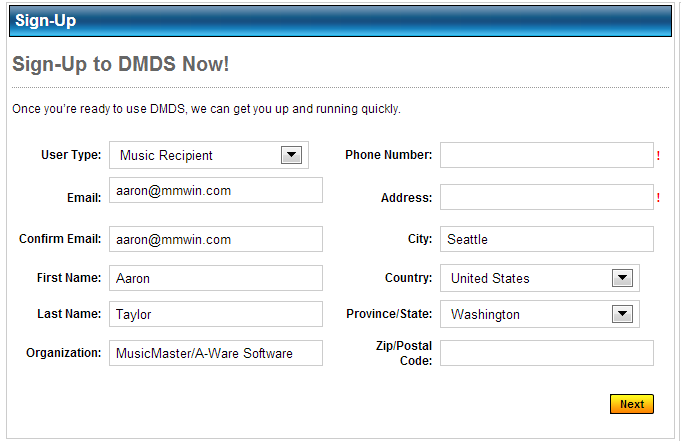 Once that happens, you are then able to download the DMDS Manager application, and access their website. Depending on your industry role, you’ll have access to content from major and independent records labels. To obtain tracks, it is a two-step process. 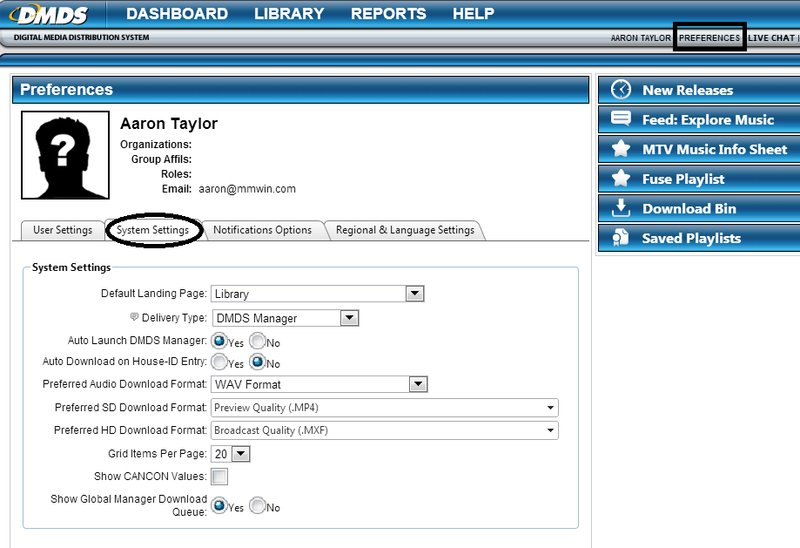 You will need to be logged into the DMDS website to select the content you’d like to download. Once you’ve selected it, you’ll then need to login to the DMDS Manager application to start the process of saving the music to your local hard drive. 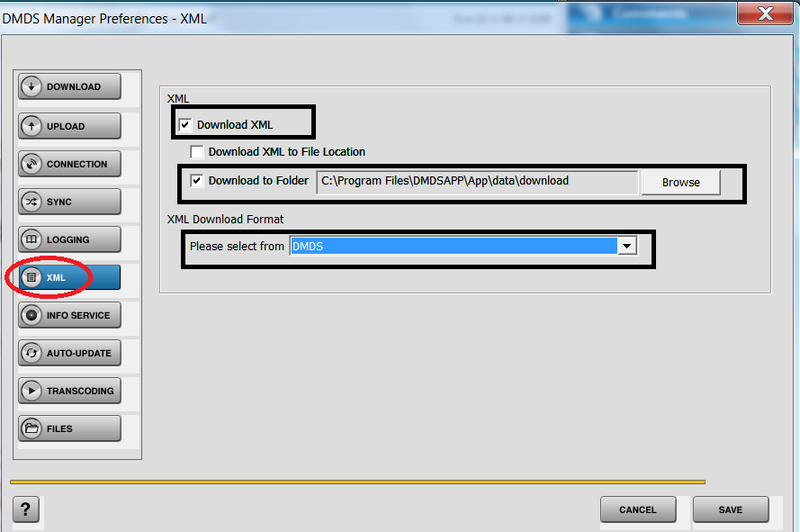 So that you’ll also get the metadata associated with the content you select, go to the PREFERENCES tab on the DMDS Manage application and select the XML selection box. See the selection boxes below and note that the “download to folder” box can be pointed to a folder on your local machine or network if you so desire. While you are here, check the rest of the available tabs and determine changes or selections you’ll need for your specific set up. Also note that on the website portion of DMDS there are some preferences you’ll want to set as well. We’ve provided a screen shot of the major one you’ll want to look at below. 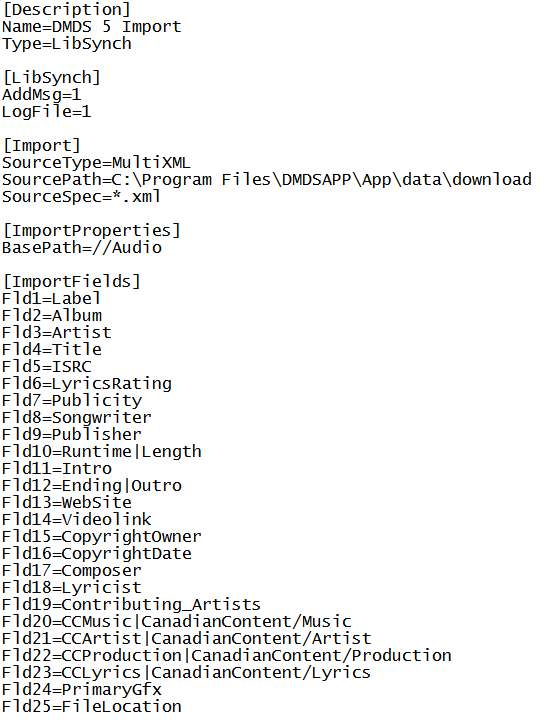 However, there is nothing in this section that relates to set up needed for MusicMaster metadata downloads. Now, you are ready to select and download content. Click on the commands section on the right to play or download desired tracks. Once downloaded, your selections will appear in the “Download Bin” on the right hand side of the interface. 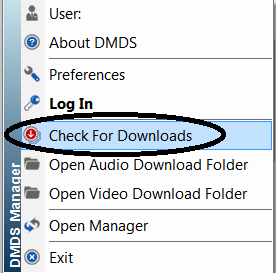 From there, it is necessary to access the DMDS Manager application and select the “Check for Downloads” option. You may need to login here first before proceeding. The tracks that you’ve selected to download will begin appearing in the local or network location you’ve specified, as well as the XML data provided by the content provider for those selections. Before you run the library synch for the first time, it might be worth a quick check to the directories for the both the content and the XML files to make sure they’ve indeed arrived in the intended locations, and make adjustments if needed. 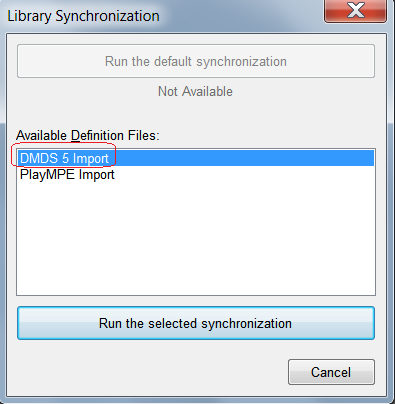 To enable MusicMaster to bring in the associated metadata with the content you’ve just downloaded, it’s time to put the DMDS Library Synch Definition file in place. Your Music Scheduling consultant can provide this to you and assist you in configuring it to your database. 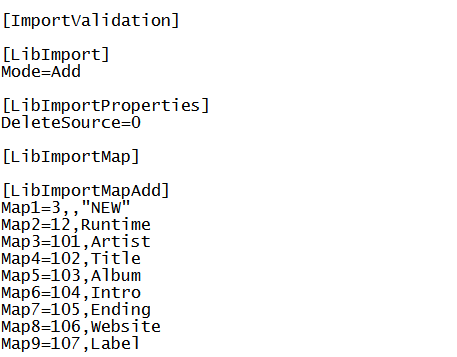 Alternately, you may elect to build it yourself, by copying the section below and saving it as a file DMDS 5 Import.def. Below are the typical contents of this definition file. (For deeper discussion of the composition of definition files for MusicMaster, review the HELP section in the MusicMaster application and select the Contents tab, Technical Reference, Definition Files). This definition file needs to be copied into the directory where your database(s) reside. Only a couple of areas need to be adjusted. First, in the [Import] section, adjust the SourcePath= to the path where the files were downloaded. Next, you’ll update the [LibImportMadAdd] section to reflect your Field ID numbers. You can find these numbers in Dataset, Library, Fields. For instance, in the example above, Field 101 is the Artist field. When you check Fields, you’ll see the number in the far left column. Change the options accordingly. The only ones you do not need to change are “NEW” and “Runtime”. These will be the same for every MusicMaster user. This is a Library Synchronization in MusicMaster. To run it, go to DATASET-LIBRARY-SYNCHRONIZE. When the available definition files box pops up, you should see your DMDS Import choice. Highlight it, and then select the long rectangular box at the bottom that says “Run the selected synchronization”. New songs will appear in a category that MusicMaster creates for you called “New”. From there, add the additional song card data needed and move songs to their appropriate scheduling categories.